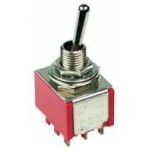 This miniature single-pole, double-throw (SPDT) momentary switch can be used as a general-purpose mi.. Note: The Pololu Pushbutton Power Switch is available in two voltage versions: standard voltage, 4.5.. This single-pole, double-throw (SPDT) rocker switch makes a great on/off power switch. It is rated f.. This single-pole, double-throw (SPDT) momentary switch can be used as a general-purpose micro switch..